Illinois' Michelle Strizak (4) bumps the ball during the game against Minnesota at Huff Hall, on Wednesday, Oct. 1, 2014. The Illini won 3-0. The No. 6 Illinois volleyball team (7-1) swept its weekend competition, but its biggest challenge came from No. 24 Kentucky (5-5). According to outside hitter Michelle Strizak, the Illini had to adjust to the tough blocking presence that the Wildcats presented. Kentucky scored off 13 blocks — six more than Illinois — and limited the Illini to just a .130 hitting percentage. The team needed a comeback effort in the first set to put away the Wildcats 26-24, but the Illini’s adjustments became evident by the third set. Illinois raised its hitting percentage from .024 in the first set to .250 in the third and committed half as many errors, leading to a convincing match victory. The Illini showed their depth against South Dakota State (1-11) by extending playing time to players who don’t see the court as often. Most notably, senior setter Alexis Viliunas took the place of freshman Jordyn Poulter for the majority of the match. She contributed 29 assists and six digs in the match. 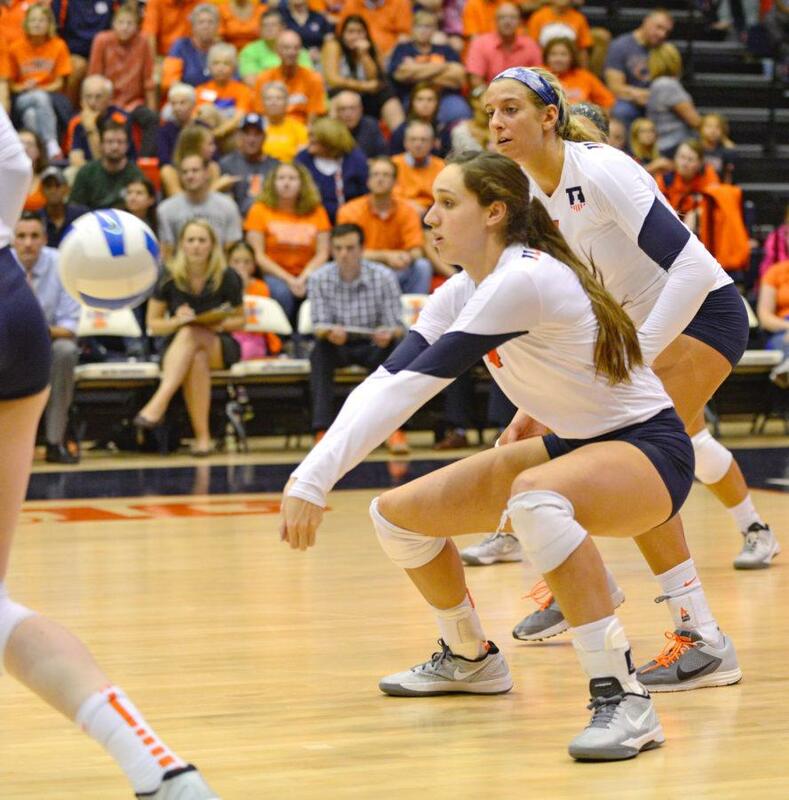 Despite starting every match for the Illini last season, she has had to take a back seat to the freshman starter. Junior outside hitter Katie Roustio also saw action against the Jackrabbits, and along with Michelle Strizak, led the team with 12 kills. It was Roustio’s second match of the season. Freshman middle blocker Ali Bastianelli scored the second-most kills in the match with nine, a season high for her. Bastianelli’s previous season-high was five. Illinois is in the middle of what will be its longest road trip of the regular season. In the span of five games, the team has played three ranked teams, including No. 2 Stanford. Besides their loss to the Cardinal, the Illini have swept all of their opponents this season with two of their biggest margins of victory coming against their two most recent opponents: South Dakota State and Wichita State. Head coach Kevin Hambly said the team is still working on solidifying its “personality.” Despite having issues offensively, he said he was optimistic about the team’s progress during the weekend. Illinois will have another weekend of non-conference play before the Big Ten competition starts on Sept. 25 at Maryland. It will be another two weeks before the team returns to Huff Hall to take on Penn State on Oct. 9.